DuMOL has an established list of estate and other premium vineyard sources, a talented winemaker and viticulturist in Andy Smith at the helm since 2000, and a modern winery in Windsor, California. The winery, which is named after the first winemaker’s children, Duncan and Molly, has developed a dedicated cadre of followers who relish the consistently superb Pinot Noirs and Chardonnays. Partners Michael Verlander, Kerry Murphy and Andy Smith lead a low profile with discrete participation in public tastings and minimal emphasis on wine critics’ scores which they do not heavily tout. This attitude does not reflect any smugness from the proprietors, but rather an emphasis on investment in the quality of wines and a preference for letting the wines speak for themselves. 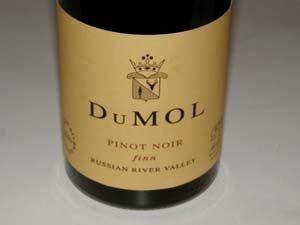 DuMOL features both Russian River Valley appellation and vineyard-specific or limited production (two to three vineyards in combination) Pinot Noirs. Most of the vineyard sources are in the cooler reaches of the Russian River Valley, and the Green Valley and Sonoma Coast appellations. The Russian River Valley appellation Pinot Noir is made in the largest quantity, offered first to those jumping from the wait list to the Pre-Release Member list, and is the only Pinot Noir in significant retail and restaurant distribution. The appellation blend is crafted with care and should not be taken as an inferior wine. 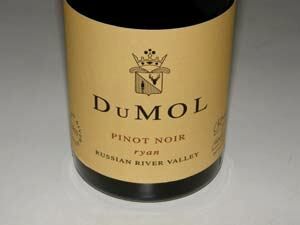 The 2009 DuMOL Russian River Valley Pinot Noir made my 2011 Second Team North American All-American list. Smith described his winemaking regimen for this wine (much of which carries over to the more limited Pinot Noir bottlings) to me recently. “This 3,900 case appellation blend is composed of seven vineyards (30% is DuMOL Estate) and 21 separate fermentation lots, and contains free run wine only. Clones are Old Beringer, Dijon 114, 115, 667, 777, Calera, Swan and Pommard. Average yield is 2.75 tons per acre. Vine age varies from 5 to 24 years. All lots are harvested, fermented and barreled individually. A selection is made in July, and racked from barrel immediately pre-harvest in early September to holding tanks. The final blend settles naturally in these tanks for 3 months before bottling in December. It is during these 3 months that the wine really harmonizes and achieves microbial stability. The wine contains our more fruit-driven and concentrated lots while the more backward and structured lots go to our vineyard-designate wines. 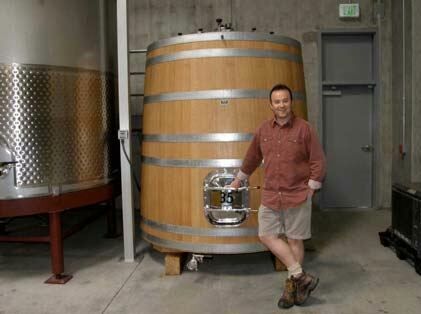 The wine spends 11 months in barrel (40% new French oak), 34 months in tank, and 6 months in bottle before release in June.” Fermentations are native and the wines are bottled unfined and unfiltered. I found all the wines to be bold and richly flavored, yet offering easy drink ability by virtue of their caressing textures and crispness. Oak is nicely supportive and well-integrated, tannins are tame, the finishing acidities are refreshing, and the wines offer early approachability, yet display the type of impeccable balance that predicts age ability. DuMOL wines are highly flavorful and seductive when young, but benefit from at least a few years of aging and have the potential for successful midterm aging of 7 to 15 years. I found it very difficult to choose favorites among this superb lineup of wines. The vineyard-specific or small-production (two or three vineyards) Pinot Noirs are not named after the vineyard source(s) but with Gaelic names including “eoin,” “aiden,” “ryan” and ”finn.” The DuMOL Chardonnays should not be missed for they are among my favorites crafted in California today. 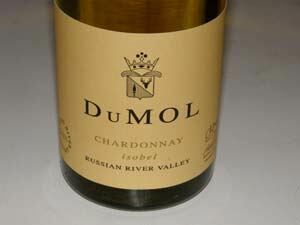 The 2009 DuMOL isobel Russian River Valley Chardonnay sourced from old vines in the Heintz Vineyard is stunning. The Syrahs have many fans as well. The winery sells most of its production through a Pre-Release Member list which currently has a wait list at www.dumol.com. There is limited retail and restaurant distribution. The winery is not open to the public. 14.3% alc., 649 cases, $80. The estate vineyard is located in the Green Valley of Russian River Valley. Close planted Calera and Swan selections. Third vintage from this vineyard. · Moderately dark reddish-purple color in the glass. Very aromatic initially, offering scents of ripe cherries, strawberries, rose petals, spice and the slightest oak. Richly flavored but possessing a charming, ephemeral quality. Tasty core of dark red berries, black cherries, baking spice and a hint of white chocolate robed in mild-mannered tannins. Cranberry and pomegranate show up on the finish that offers bright acidity. Still solid the next day from a previously opened and re-corked bottle. Will benefit from a few years in the cellar for full expression. Impressive. 14.2% alc., 776 cases, $80. Sourced from the Dutton-Widdoes and Abbott vineyards located on the western edge of the Russian River Valley. · Moderate reddish-purple hue in the glass. Very ripe fruit profile emerges over time in the glass featuring dark red berries and cherries along with a forest floor tone. A fat, silken, sweet core of vivid dark red fruit makes an impression on the mid palate and persists on the fresh, crisp finish that displays a cut of citrus. Beautifully balanced with soft, sleek tannins. The wine pushes the ripeness envelope but never crosses over. Fabulous the next day with remarkable intensity of flavor from a previously opened and re-corked bottle. 14.2% alc., 448 cases, $76. Sourced from the 3-acre Wildrose Vineyard in Green Valley. Dijon clones 115 and 777. · Medium reddish-purple color in the glass. A chameleon of a nose offering glimpses of black cherries, biscuit, and savory oak that come and go. Full-flavored and complex offering notes of blackberries, black raspberries, black tea, leaf, and oak vanillin. The tannins are supple and the wine finishes with bright acidity. A solid, even special wine. Very good. 14.1% alc., 400 cases, $76. Sourced from the Hyde family’s Sonoma Stage Vineyard located at the southern edge of the Sonoma Coast. · Darkly colored in the glass. Remarkably beguiling nose offering aromas of fresh-picked darker berries with just the right accent of toasty and spicy oak. Full-bodied and bold with an array of perfectly ripened dark berries with a subtle underpinning of earthiness, showing good persistence on the finish. Firm, but well-tamed chalky tannins add texture. The flavors don’t yet match the irresistible nose, but give this wine a little time in the bottle. Very good (+). 14.3% alc., 392 cases, $80. A multi-clonal blend from three vineyards at the western edge of the Russian River Valley. · Dark reddish-purple color in the glass. Patience is required with this wine which slowly evolves in the glass over time, ultimately yielding frambiose aroma and flavor with discreet intensity, wrapped in a complimentary supporting tannic structure. The mouth feel is strikingly smooth and comforting and the overall impression is one of style and finesse. Decant if you pop a cork now. 14.3% alc., 1,174 cases, $60. Sourced from old-vine Charles Heintz Vineyard in the Green Valley. Aged 18 months sur lie. · Light golden straw color in the glass. Aromas of quince, lychee, baked apple, flint, and subtle oak-driven scents of buttered popcorn and toffee. Delicious flavors of apple pan dowdy, honey, citrus and toffee with a slight tropical fruit riff offered in a discreet and charming style. Impressive finishing show for a Chardonnay. Still great two days later from a previously opened and re-corked bottle. I had a second bottle at a restaurant a week later with lunch and it was even better accompanied by a persimmon-studied very lightly dressed salad. I have had more great Chardonnay drinking experiences from Charles Heintz Vineyard than any other vineyard in California.